Tintin Heart: Tags Challenge - Cards Galore Challenge Blog. Today I am blogging about my DT project for the Cards Galore Challenge Blog theme TAGS. I know it is a crime to think of Christmas in July but someone has to do it and it might as well be me. I tried to think of a design that could be repeated and was easy(ish) to put together; who wants more work at Christmas ?, and I came up with this Tag . My base is a piece of red cardstock with the top two corners rounded. I added a strip of red check ribbon with a tassle border and laid a piece of cream cardstock, same width as the base and about 1'' high with a perforated edge on top of the ribbon. The piece of cream card also had two brass-coloured brads added to the left-hand side for decoration. I stamped the Santa onto watercolour paper and coloured him in with watercolour paints. To deepend the red of the hat I used Glossy Accents which also created shine. The Santa was cut out and adhered to a hand-cut tag in dark green cardstock with a torn edge and this was popped up with dimensional adhesive on the tag and set slightly at an angle. I stamped the greeting in gold Versa Color ink and added colour to the holly leaves and berries with red and green marker pens. I must confess I am a bit pleased with this Tag and I think I have solved one problem that erupts around Christmas. Don't forget to take a look at the Cards Galore Challenge Blog and check out the DTs work which be showcased throughout the month of August. I was pleased to see that I was chosen along with my teamie Barbara to be the first two Tags featured. Thank you again for visiting and taking time to read my blog. Your time and comments are much appreciated. Maybe this is good time to think about Christmas. Great tag!! I love the ripped detail and the lovely Santana head you have used. 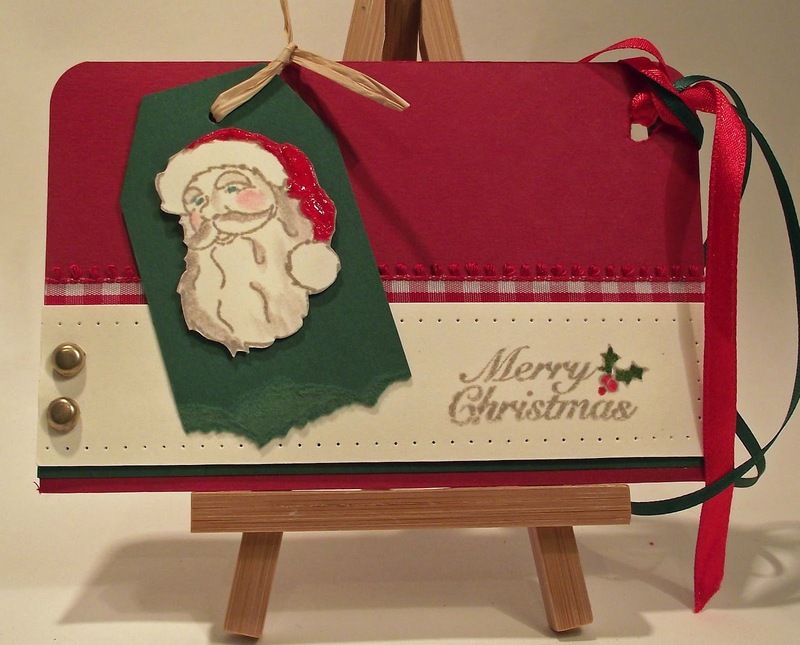 All the elements tie together a very special Christmas tag! Lovely tag, nice and traditional.